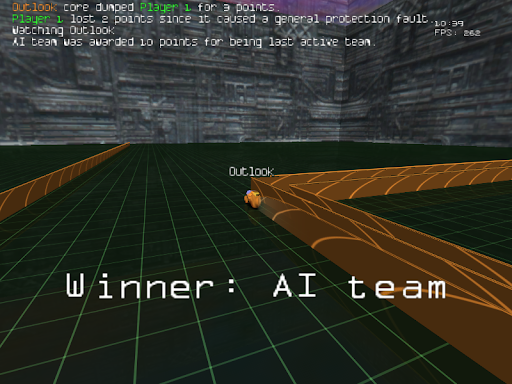 Armagetron Advanced is an open source game inspired by the movie Tron. For those who haven't seen Tron: in this game, two or more players use a vehicle called "light cycle" which leaves a coloured trail behind; making contact with the trail or the walls is fatal, so the goal is to "box" your opponents. "Armagetron is a multiplayer game in 3D that attempts to emulate and expand on the lightcycle sequence from the movie Tron. It's an old school arcade game slung into the 21st century. Highlights include a customizable playing arena, HUD, unique graphics, and AI bots. For the more advanced player there are new game modes and a wide variety of physics settings to tweak as well". The developers tried to make it look and feel exactly like the movie and for the most part they've succeeded, though the graphics need a bit of work. At first, the game may seem too simple and I must admit, playing against AI becomes boring quite fast but it's very fun if you play it against your friends. And it's actually not that simple as there are many moves and techniques that you can learn, so it takes time and practice to master Armagetron Advanced. Armagetron Advanced can be played against AI opponents, humans (LAN or Internet - many servers available) or a mixture of both and there are several game modes available: Deathmatch, Classic, Fortress, Sumo or Team Death Match - more about this on the Armagetron Advanced wiki page. Armagetron Advanced is available for Linux, Windows and Mac OSX and even though it was launched back in 2001, it's still under active development. and then install one of the following packages: armagetronad (this will install the latest release candidate), armagetronad-alpha, armagetronad-beta or armagetronad-experimental.